Understanding how your property taxes are calculated can often feel like unraveling one of the deepest mysteries of the universe. However, it’s vitally important that you get your arms around this tax, if you are subject to it, as it’s often a large expense that you may be saddled with for a lifetime. Property taxes can vary wildly, not only between different areas of the country, but even between different parts of the same municipality. Just how do property taxes work? Shouldn’t they be the same for everyone? On the other hand, you may also have “personal property,” which is basically anything else that you own that may have a title and can be moved, even if it takes a bit of work. Your fishing boat, your car and, to confuse matters further, most manufactured homes, are considered personal property – not real property. Manufactured homes specifically can be a bit of a sticky wicket because you can often affix one to your real property in such a way that it also becomes real property. For the purposes of this discussion, when we say “property tax,” we’re talking about real property, less any specially qualified manufactured homes. Most people know that their property taxes are calculated based on the value of their property, but there are lots of homeowners who don’t realize that what we all generally refer to as “property tax” are actually several different taxes smashed into one greater tax sandwich… or layer cake, if you will. Each of these layers will have their own tax rate, making the calculation of your property taxes even more confusing. 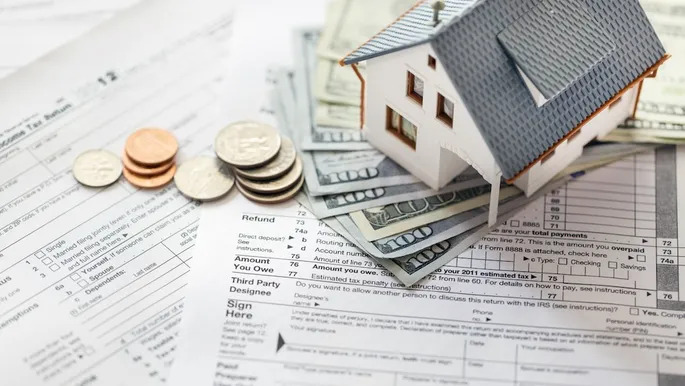 And by the way, the value used to determine your taxes isn’t necessarily your home’s appraised value, it’s something called the assessed value. Property tax assessments are often one of the most confusing concepts for most new homeowners. However, you need to have a handle on it in order to understand your property taxes. The assessed value absolutely is what your taxes are based on, but there’s no set way for any tax jurisdiction to determine this number. In some places, your property’s assessment and your home’s market value may be more or less the same, in others, the assessment is a stated percentage of the market value. In addition, these values might be updated yearly, every other year or only when the home is resold. If you meet certain requirements, you can also have your assessment frozen so that your taxes can only increase if the rate itself increases (and even then, there are a few states that will freeze your actual tax rate). Put another way, knowing how your property assessment will work is kind of the key to how everything behind the scenes works. Without that, all the layers of government grabbing at your wallet are pretty meaningless. Fortunately, if you’re just looking to simple math, this figure is provided for you by your taxing bodies. We recommend you call or drop into your local tax assessor’s office to get a detailed explanation of your specific tax situation as every taxing body may be slightly different. Wait, What’s a Mill Levy? You’ve probably seen the term “mill levy” tossed around if you’ve been reading up on property taxes. A mill levy is just another way to describe the tax rate that’s being applied to your real property’s assessed value. One mill is equal to a buck per $1,000 of the real estate’s assessment, or 1/1,000 of a penny. The mill rate that determines your tax is set by the taxing authorities themselves. For example, let’s say your property is assessed at $250,000 (by whatever method). If your county mill levy is 5, then for every $1,000 of assessed value, your bill goes up $5. In this case, that’s a very reasonable sounding $1,250. Remember, though, this is just one layer of the tax layer cake. You’ll need to add all the layers together to get your actual tax bill. Get your calculator ready and pour yourself a stiff drink – this could take awhile! There’s no better or more reliable source for tax information than the people on the ground nearby. That might mean CPAs, real estate agents, home appraisers or even a mortgage pro. They can help you make more sense out of your tax bill.